What is the Pocket Panda? Phat Panda brings you the Pocket Panda, the best Panda experience on the go. Being a Panda has never been easier. 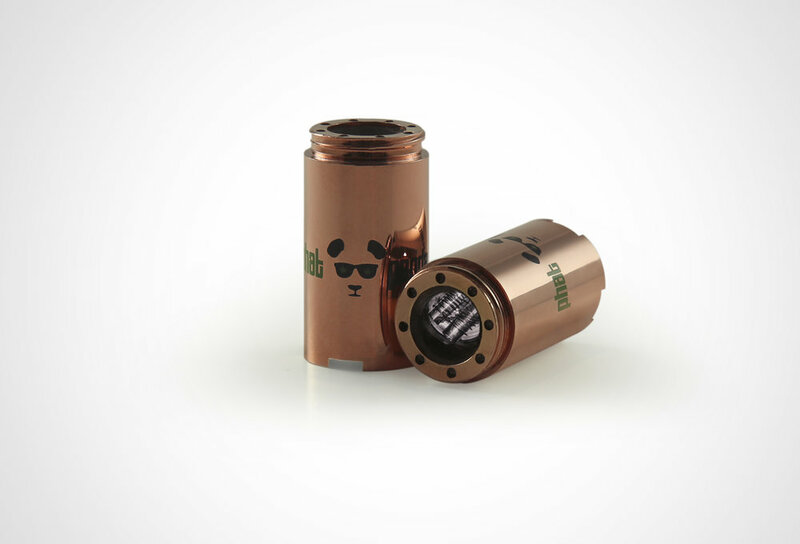 Shoot right to the moon with our biggest cloud producing full quartz dual coil system. Our dual coil brain will perform best on a medium or high setting and works best with wax or shatter. This little guy is our hardest hitter and is sure to provide clouds that will have you soaring! Step into a world of flavor with our quartz ceramic coil-less hybrid system. The coil-less Panda Brain works best on a high setting and will be fantastic with any type of extract. The coil-less brain is designed for a terp tasting experience that is unparalleled. Pocket Panda’s revolutionary and patent pending airflow design is truly a breath of fresh air. Our Venturi driven airflow system allows air inlets to be placed outside the main chamber providing two main benefits: increased cloud production, and a greater level of protection from leaks. Everything from our battery vents to the airflow routing have been completely been re-imagined and re-designed to make the Pocket Panda the most advanced pen-style vape to date. Pocket Panda’s battery not only has overcharging protection. In addition, you don’t have to deplete it before charging, so charge away at night before you sleep and have it ready throughout the next day. Oh, and in case you missed it - the battery charges via a Micro USB, simply unscrew the lid on the bottom of the battery to access the charging port. (You may enjoy the Pocket Panda while it’s being charged). Your Pocket Panda will be shipped within 1-2 business days via USPS Priority. Once shipped, a tracking number will be provided to you via e-mail. * All 3 Panda Brains are included in the Rose Gold Edition. Please select USPS Priority Shipping at checkout. For Gunmetal Edition, please click here. If you have any questions or concerns, please direct them to support@phatpandastore.com and we will do our best to respond in a timely fashion.